Poppa Bear Custom Cycles is the motorcycle shop to call when it comes to installing a reverse gear kit on your motorcycle or trike. Mechanical reverse gears make parking anywhere possible! No more struggling to back your bike or trike. We install reverse gear kits from Aim-Tamachi. Both 5-speed and 6-speed kits are available, depending on your bike/trike. 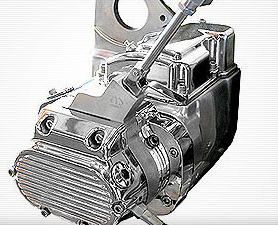 This unit is different from traditional units because you do not have to remove the transmission gears; the unit works off counter shaft mechanisms. No longer do you have to wrestle your trike out of a tight parking situation. You can safely and easily back up in reverse using the throttle and clutch. All reverse functions are on the handlebars and/or inner fairing. By design it is mechanically impossible to be in reverse and a forward gear like other units on the market. Maintain the freedom of being powered by an American Big Twin – even in reverse! Call us today at 410-937-3766 talk about installing a reverse gear on your bike or trike.